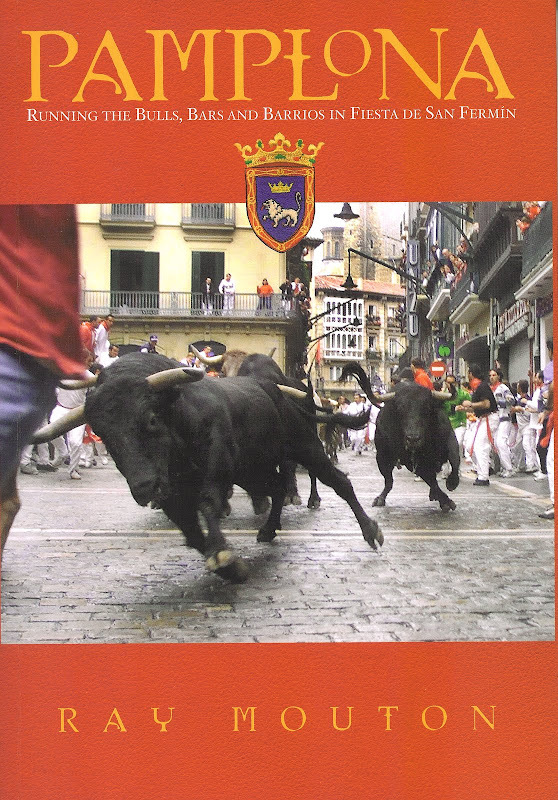 Gerry Dawes's Spain: An Insider's Guide to Spanish Food, Wine, Culture and Travel: Highly Recommended Book: Pamplona--Running the Bulls, Bars and Barrios in Fiesta de San Fermín by Ray Mouton. This book may be purchased at Amazon.com (see banner at the top of this blog). I highly recommend Ray Mouton's Pamplona: Running the Bulls, Bars and Barrios in Fiesta de San Fermín is the best book you are likely to read on Pamplona, the Running of the Bulls and the foreign contingent who descend upon Pamplona in early July every year to watch yet another chapter in the extended living version of Ernest Hemingway's The Sun Also Rises. Slide Show: Double click to see enlarged version. Disclaimer: Mouton was kind enough to use a few of my photographs in the book, give me some paragraphs as a contributing photographer and autograph a wonderful inscription in the frontispiece to my copy of his book, but none of that would make a difference if this were not a great book. Believe me, from one who has been to San Fermín some seventeen times, this book is the real deal! Persistence of Memory* (Salvador Dalí) Five-Watch Rating.